Authorized Distributor of Citel Products > Radar Inc.
Citel specializes in the manufacture of Surge Protective Devices (SPD). These devices protect sensitive electronic equipment and personnel from destructive transient over voltages originating from lightning strikes and line disturbances. 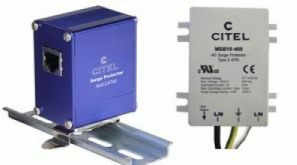 Citel is unique as both a manufacturer of PC board level surge arrestor components and their deployment across a full range of Surge Protective Devices for AC power, DC power, data line and RF coaxial applications. This provides Citel with an unparalleled ability to develop high performance products that deliver consistent results for any application within a customer's facility or remote site. Citel's products can be found within the agricultural, alternative energy, electric utility, oil & gas, process chemical, telecommunications, water & wastewater treatment, government, military, security, transportation and commercial/industrial markets.